When your brain wants to send a message from one neuron to the next, it uses chemical substances called neurotransmitters. One of the major neurotransmitters in the brain is called serotonin. Studies in animals and humans have revealed that serotonin is responsible for feelings of well being, calmness, relaxation, confidence and concentration. So, what happens if you don’t have enough serotonin? Fear, aggression, anxiety. But you’d be surprised at how often serotonin deficiency is simply due to dietary imbalances. Easy to fix. Tryptophan (an amino acid) is converted into 5-HTP (another amino acid) which in turn, is converted into serotonin (a neurotransmitter). When we first started making herbal products, we formulated our Calm mix using tryptophan. But we encountered a problem – the product seemed to become less effective with time. What does this mean in terms of our animals? 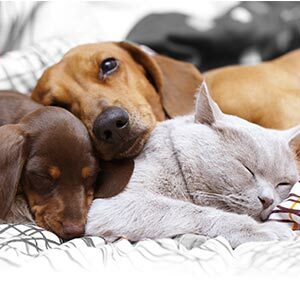 It means that if you have an overly aggressive, nervous, anxious, timid or overly excitable dog, supplementation with Serenity Formula might just help. Also, with Guy Fawkes coming up, it may make traumatic experiences slightly less traumatic. Hi Sue. Apologies for the late reply. Please try our Serenity Formula. It sounds like this is nervous behaviour that has become a habit. He might need some training as well….. Best of luck! My Dog is a Rough Collie, he is 8 months okd and he barks a lot. I work all day and my neighbors are complaining. Margie, I can’t say for sure, but it should help. Give it a try – it it doesn’t help, I’ll refund you whatever you paid. My dog has fear aggression and does improve with low protein, natural food. But he is still anxious around lone men and I am looking for a supplement to alleviate this. Geraldine, it sounds as if you are treating him well. I would suggest trying Serenity Formula as well, it acts like an antidepressant and just makes life a little easier for the dog. My 1yr old Basset Hound (Droopie) is suffering from epilepsy. Would a product like above help for her sickness? Nadia, Serenity Formula isn’t specifically for epilepsy. Also I would ask a vet before giving it to your dog – I’m not too sure of the possible interactions with other drugs.